Location: Home Community Forums Weekly Knockouts MX Knockouts - We need your maps! MX Knockouts - We need your maps! The weekly Knockouts held by Mania Exchange regularly need new maps to keep the competition fresh and interesting! All players are welcome to submit maps for possible inclusion. Below are the map groups you can build for, as well as mapping guidelines, and information about submitting a map. Spreadsheet - Maps - Map Groups, and Map Lists with statuses of each map. Spreadsheet - Schedule & Results - Schedule and Results for the KOs. Knockout Maps Upload - Use this link to upload your map. ManiaCalendar - Schedule for KO and other ManiaPlanet events. MX KO SignPack - The allowed SignPack. United-Car-in-Stadium Base Maps - Base maps to build KO5/KO10 tracks in Stadium using the United cars. - A clear and simple design. Easy to complete on your first run. - No parts that require perfection in speed or extremely precise steering. - PF starts are problematic for analog drivers. Avoid using them. - You should be able to complete the map from any checkpoint respawn. - Checkpoints should be placed no more than 10s apart, as calculated from a respawn. - All guidance signs should be either default signs or signs from the MX KO SignPack (see below). - Signs should be easy to follow and used consistently. - Down arrows above jumps help drivers know where to aim. - Signs should compliment good leading scenery. - Other custom signs with locators can be used for non-guidance purposes. - No unintended shortcuts, or intentional secret shortcuts. - Multiple finishes, if used, should be visible to first time drivers, and obvious which is faster. - Easy to intermediate difficulty (e.g. blue/red Nadeo platform). - Every CP should have similar difficulty. - Good sign placement and pathfinding (GPS not required, but GPS at a CP is ok). - Don't be afraid to build tricky spots that need you to slow down a lot. Due to speedbugs, extensive use of magnets is discouraged. Speedbugs seem to occur most often when the car loses contact with the road, but maintains magnetic attraction. This can happen on outside curves and twisty roads when the car has a lot of speed. We'll consider each map on its own merits. If magnets are used in such a way to limit the possibility of speedbugs, the soft limits below may be overlooked. - See the extra rules & info post. 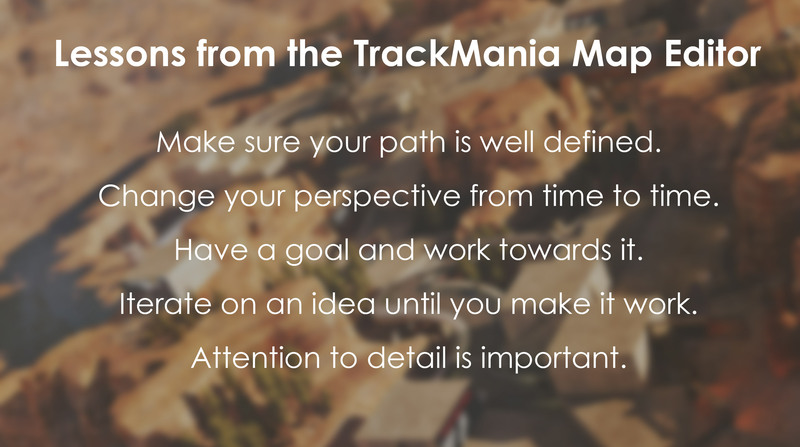 TrackMania One Titlepacks: Extra rules & info! This sign pack consists of one full single-colour set of signs (black) and all flat-colour 'wall' signs from the MX Sign Pack 2.0. If you already have the full regular MX Sign Pack 2.0, then you will already have these signs and don't need to download this pack, however we ask you only use the signs mentioned above in knockout tracks. For those who don't want to download these signs, but wish to play the knockout, before the first round, a map will play that displays all signs within the pack to allow your game to download them ahead of time. - KO maps may get played for years. Polish the design, scenery, and signage before submitting a map. - Submitted maps must be secret; not uploaded or played anywhere else. - Do not add a password. - Inappropriate map names aren't allowed. Upload your map by 19:00 CET on the Thursday before a KO to ensure it is tested for that KO. Otherwise, it will be tested for a later KO. Please note, no more than 3 new maps per author will be played at each KO. How do I upload my map? Use the Knockout Maps Upload link. Be sure to set the map as unreleased! The map should appear in the Knockout Uploads group and in your maps list, but not on the front page or in recent tracks. The map cannot be downloaded by anyone other than MX staff. What happens if my map is accepted? - We move your map to the relevant Knockout group and add it to the server for the next weekend that group of maps is used. - You'll also receive a message on the map page letting you know the map was accepted and a mention in the #knockouts channel on MX Discord. What if modifications to the track are requested? - We move your map to the Modifications Needed group. - We will also comment on the map page with what needs to be changed and/or message you on Discord or on MX. - Once you've updated the map, let us know. - We will check the map again and see if we can accept it. - Further modifications may be requested. Otherwise we will accept it. - Sometimes modifications are requested again after the map is played in a Knockout, if other issues are found during live play. - We reserve the right to update your map if you're inactive (haven't logged into MX for over a year) or do not respond to requests to update the map in a reasonable amount of time (~1 month). If we do update your map, we will credit you in the track name. Example: "KO8 - JumpMania (by Tuta)"
If my map is accepted, when can it be released? - Accepted KO maps are eligible for public release 6 months after they were first played in a Knockout. - We will leave a comment on your map with the date it can be released. - You can remove the KO tag from the name or keep it on. We recommend removing it, so players know the map can be downloaded. - If you wish to release your map, and the required time has elapsed, you should contact a KO admin so the map can be moved to the MX Knockouts - Released group. Then you can release the map. - Publicly released KO maps may continue to be used in the KO. What if my map is rejected? If your map is rejected, this means the map is unsuitable for the Knockout. - Move your map to the Rejected Maps group. - Leave an explanation in the comments section. Maps are rejected when it's decided that drastic changes would have to be made to make the map suitable. Can I release my rejected map? - Yes. You can release your rejected map if you remove the KO tag from the map name and unhide the map. Do not post in this thread! Any such posts will be deleted. This topic is for news and information about building for the knockouts. Please note, this pool is closed for now. Future maps built in the upcoming Alpine v2 will be in the KO11 map group. We're opening a new section for KO9. You can now build maps in TMOne Alpine. All the usual rules for KO9 apply except that maps must be between 20 and 30 seconds! The maps are used for both Time Attack and Rounds knockouts. No use of default Valley blocks or embedded items. Don't use ghost mode when placing items, unless you can make it look real good. Don't use heavy item mix. Making it look realistic and not too weird is important. Be careful about building uphills. The Alpine car can be underpowered going uphill and even stall out. Watch the pillar guide video to see how to place them to not make structures float. Slight mixing allowed, but make it look as nice as possible towards realism. Make some nice scenery around the immediate vicinity of the map. Have a look at campaign maps to get inspired. All of them can be found on MX as well. Be careful with the use of turbos. Respawns should work well (no CPs on ice). Be careful about blind obstacles in tubes. Force internal cam in tubes when car needs to change height. The first post in this topic has been updated. - Discontinued: The rejecting of "Modifications Needed" maps after 3 months passes without updates. - New: limit of 3 new maps per author for each KO event. - New: A new group, KO10, has been opened for EnvMix Time Attack maps. - New: We'll start leaving a post on each map page with information about when the track is eligible for release. - New: Deadline added for map submissions. Upload your map by 19:00 CET on the Thursday before a KO to ensure it is tested for that KO. Otherwise, it will be tested for a later KO. - Changed: EnvMix maps no longer allowed in KO9. - Added: Multiple finishes, if used, should be visible to first time drivers, and obvious which is faster. In addition, the "About the MX Knockout" topic has been updated. - Added: Detailed Rules. Previously they were buried in the results topic. - Added: Screenshot of the KO schedule from the spreadsheet. Please note that the section on magnets in the first post has been changed. Soft limit on Lagoon magnets has changed from 75% to 50% and an additional soft limit of 25% has been placed on the other 3 environments. Some maps may be grandfathered in. We'll consider them on a case-by-case basis. We are excited to announce the opening of a new map pool called KO11! The map pool features tracks between 30 and 50 seconds which will be used for all future TMOne titlepacks. Currently, tracks can be built in the TMOne Speed titlepack. This titlepack is a re-creation of the Desert environment and is announced to be released on the 14th of July. Our aim is to kick things off with a first KO on the 21st of July during the evening (21:30 CEST) (this may change). Currently, to get access to the titlepack (to be able to build), you need to be part of the beta for TMOne Speed. Join the TrackMania One discord server and ask Florenzius to gain access. Send a private message to Florenzius on the Maniaplanet forums. Note: Due to the titlepack being in beta, small changes to items can still occur that could potentially break maps. We will make sure that map builders are informed when this happens. All the usual rules for knockouts apply except for the following! No use of default Valley blocks or embedded items (rare exceptions). Ghost mode and blockmixing is allowed, but keep it reasonable and not too 'weird'. Due to recent physics bugs, magnets wallrides are not allowed in KO11 until further notice. Overriding the general rule: it is possible to have more than 3 new maps per author played at each KO. Note: The maps are used for Rounds knockouts only. Watch the map editor introduction video which should explain the basics. Slight mixing is allowed, but make it look as nice as possible towards realism. Make use of pillars to avoid floating blocks, realism! Need inspiration? Wise words from Eyebo. - Added: A paragraph under "What if modifications to the track are requested? ": We reserve the right to update your map if you're inactive (haven't logged into MX for over a year) or do not respond to requests to update the map in a reasonable amount of time (~1 month). If we do update your map, we will credit you in the track name. Example: "KO8 - JumpMania (by Tuta)"
- Removed: The rule about embedded items being disallowed for envmix maps. The bug which prompted the rule in the first place has been fixed some months ago. In addition, some tweaks have been made to the MX KO Maps spreadsheet. - Hid: The KO9A sheet as the pool has been suspended/retired. Future Alpine v2 maps should be submitted to KO11. - Hid: A couple of columns used for sorting maps by style and quality. - Removed The "Date First Played" column, as it was redundant. Instead we'll calculate the date a map will be eligible for release based on the date first played and only list the eligible date. - Removed The "Released?" column, as it wasn't really needed. Want to see what maps are released? You can check the "MX Knockouts - Released" group here on MX. - Merged: The URL column and the Map Name columns. - New column: "Sorting" - M for Main pool, A for Alternate. Instead of retiring some maps that are maybe a little crazier or quirky to drive, we'll have them in an alternate pool for playing sometimes for fun. - New column: "Path" - This will enable us to more easily generate matchsettings and shuffle the maps in a more interesting way, by mixing up the environments and authors better. - New column: "Vehicle" in KO7 sheet. Turns out some KO7 maps are EnvMix, so we've added a Vehicle column. - New column: "Last tested". The name of the tester and the date the map was last checked. This will help admins and builders alike see when their map was last checked, in case modifications were made, etc.